In today’s internet marketing game, if you’re not using a social media marketing strategy that is based on quality content, realistic expectations, and solid study of the medium and statistics, then you’re nowhere near what’s happening. If you intend on becoming a viable player with social media marketing you’ll need to know some fundamentals by which you can stand on. The first and foremost thing you need to do is: study. That’s right, study. You need to study up on what each social media website has to offer, how to operate and interact with them. Each has its own features, rules and terms of service. Make a mistake and you can end up being banned and that would put a cramp in your marketing goals, wouldn’t it? Study goes further than just knowing how the sites operate. You’ll need to study the way the users engage with the site and one another. They’re your potential audience and making sure you don’t insult anyone or cause fights, means you’ve the opportunity to turn them into customers of value and equity. It can be a chore but if you look at it from the viewpoint of a game, you can find it an enjoyable experience and something to look forward to. 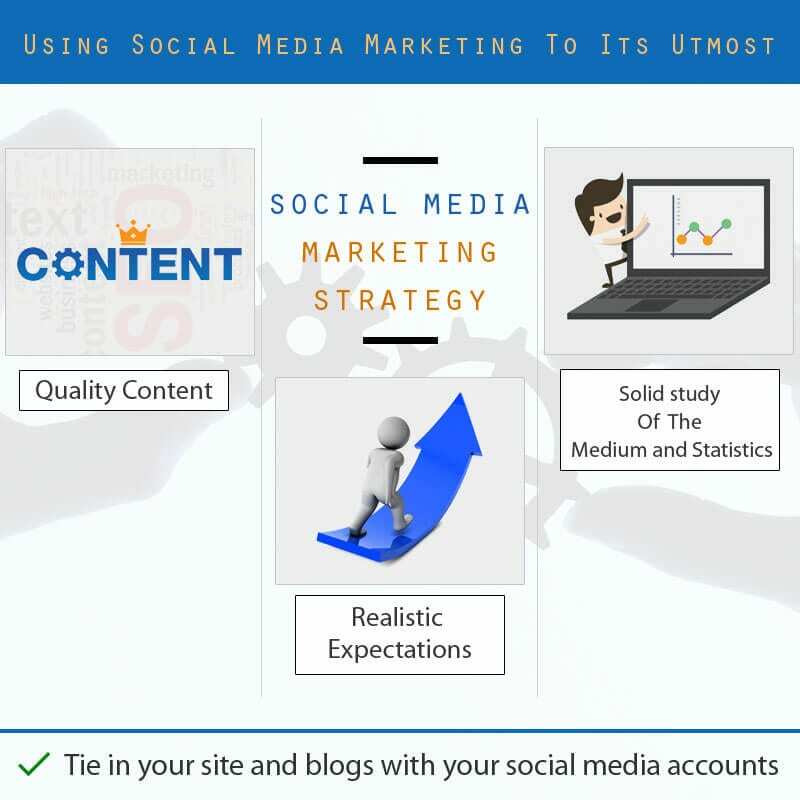 Quality content is another key to success with social media marketing. Don’t even think you can slap any old article, picture, or video or even graphics meme and get a billion likes and shares. It doesn’t happen that way and people will shun you and you might get banned. Look around at what is popular and why. If it’s popular in one niche, you’ll need to adapt that approach to your niche. Don’t steal content ever. If you steal content and get busted, you will get a global bad name and it’s almost impossible to rise up from that. Tie in your site and blogs with your social media accounts, perhaps you’ll need to make multiple accounts for this to separate you personal sites from business sites. Don’t let either invade the other or you’ll have a mess on your hands. In many cases you can import your friends from one social media site to another. It’s like bringing in your own homemade fans. This saves time and money and makes for great advertising to get people from one site to join in your adventures. By doing this you’ll have potential customers not only from your opt-in friends, but their opt-in friends. This can reach into the millions easily, however you had better be ready to handle the feedback and responses and never, ever spam. Engage your audience with humor and appreciation. You’ll make them feel comfortable and they’ll initiate conversations or commentary. This will encourage them to share, like, comment on your content and that’s like free advertising. An active social media marketing campaign will also affect your SEO campaigns. Google and the other search engines are gauging social media activity that refers to you site and that means a lot. Keep the content clean and never fall prey to people wanting to partner up and use your accounts to promote their goods. It can be tempting, but if they screw up once, you’ll hear about it all over the place for years to come. Your social media marketing campaign is ‘your’ campaign and no hangers on allowed. Remember that the keyword here is ‘social’, your reputation as a producer, marketer, and more are on the line every second of the day. If someone gives you a compliment, pounce on it, exploit it, put it into an advertisement. If someone has a complaint, do all you can to reassure them that you’ll not only work on the problem but you’ll see to it, the customer satisfied or their money back with a bonus. Basically you’ve got to be smart, extroverted, and ready to remedy any problems that arise and your social media marketing campaign will take off.